Edwards | Scuffalong: Genealogy. Edwards – Scuffalong: Genealogy. They would not have taken them in church. Hannah Speight – “I claim pension as the widow of Bailham Speight but who served during the Civil War in the U.S. Army under the name of Bailham Edwards.” His brother Lafayette Edwards “lives at Bull Head which is eight miles from Goldsboro.” “I was born on Appletree Swamp near the town of Stauntonberg, Greene County. N.C. and was a slave; was owned by Lawrence Brown. I am the daughter of Rosetta Sauls. My father was Sheppard Sauls. I was known as Hannah Sauls prior to my marriage to Bailham Speight. … [A]fter our marriage we lived as husband and wife till he died December the 21st 1902.” “My husband was born and raised in Greene County. He was about six years older than I was still I knew him before he was grown….” “After his discharge he went to Georgia and was there just twelve months I do not know in what part of Georgia he was. No, I guess it was South Carolina where he went for he went away with Capt. Bill Taylor to work turpentine. … I married my husband about four years after the close of the war and we were married in the month of November in Snow Hill….” Married at Rebecca Bess’ house. She is deceased, as are witnesses Martha Sheppard, Luke Sheppard, and Charles Moseley. Maria Lofton did not witness, but could testify to marriage. She lives on Dr. Parrott’s plantation near Falling Creek. Amos Ellis, Lafayette Edwards, and Violet Edwards would have heard of the marriage, as would Isaac Lynch. … “My husband was raised five miles from Snow Hill on the Betsey Edwards place.” “My husband had a woman before the war. She might be called a slave wife and her name was Jennie. My husband told me she died in Newbern about the close of the war.” “At date of death of my husband I had one child under 16, viz., George Speight and he was fourteen on the 26th of last September. I never had George’s age set down by I remembered it all the same and I have always celebrated the twenty sixth of September as being his birthday and I am absolutely sure that he is now fourteen going on fifteen.” Midwife Mariah Moore lived one mile from Kinston in Harveytown. “After my marriage I lived for twelve months on the place of Dr. John Harvey and then I moved down here; moved here in the Fall of 1870 and have been here ever since. Everybody both white and black know me around here.” Deposition A.
Hannah Speight — Sixty-one years of age and lives four miles from Kinston. “I have had eleven children – ten by Bailham Speight and one by Loderick Artist. I never lived with Loderick Artist for during the time he came to see me I was living in the house with my mother and father. We were engaged to be married but after he got me in trouble he went and married another woman. He married her before I married Bailham Speight. He married a woman named Mandy and lived with her till he died ten years ago. He died in the neighborhood of Speights Bridge. No, I never went under the name of Artist nor was I ever known as his wife and never lived with him a day. Our relations were all of a secret nature.” Deposition B.
February 11th 1896, Kinston N.C. I know they were married by law. Feverish with malaria, friends and family at his side, Baalam Speight closed his eyes a final time on 21 December 1902, free of the pain that had wracked him for years. He left a widow, Hannah Sauls Speight, and nine children, but little otherwise to show for a lifetime of hard work. Hannah and youngest son, George Speight, just 13, faced uncertain times. Baalam Speight was born about 1840 in Greene County. In the waning days of the Civil War, he and his brother Lafayette Edwards slipped away from their plantations to make their way to Morehead City, North Carolina. There, in March 1865, they enlisted in Company H, 14th United Stated States Colored Heavy Artillery. Baalam had not yet adopted his father’s surname and joined the army as “Baalam Edwards.” He and his company served garrison duty at Fort Macon until mustered out on 11 December 1865. In 1890 and again in 1892, 1895 and 1896, Baalam applied to the U.S. government for a veteran’s pension. Though he once been a “well developed, powerful built man,” he complained of “fluttering of the heart,” muscle pains, eye disease as a result of measles, rheumatism, lumbago, deafness and “misery in the head” attributable to exposure during his military service. Several doctor’s examinations concluded, however, that Baalam’s troubles were primarily attributable to old age, and his claims were rejected. Mariah Moore – midwife; 78 years old in 1904; lives near Kinston, Lenoir County; delivered Baalam and Hannah’s youngest son George Speight; her unnamed husband died in July 14 years ago. The testimony was satisfactory, and Hannah was granted a pension of $10/month. A document in this pension file lists Baalam’s children as Charles, born 12 April 1870; Nancy Susan, 19 February 1872; Lizzie, 8 March 1874; Claiborn, 30 March 1876; Major, 27 September 1879; James, 8 April 1882; Franklin, 19 June 1885; Luvenia, 5 April 1887; and George Meade Speight, 26 September 1889. Census records reveal a tenth child, who was oldest. 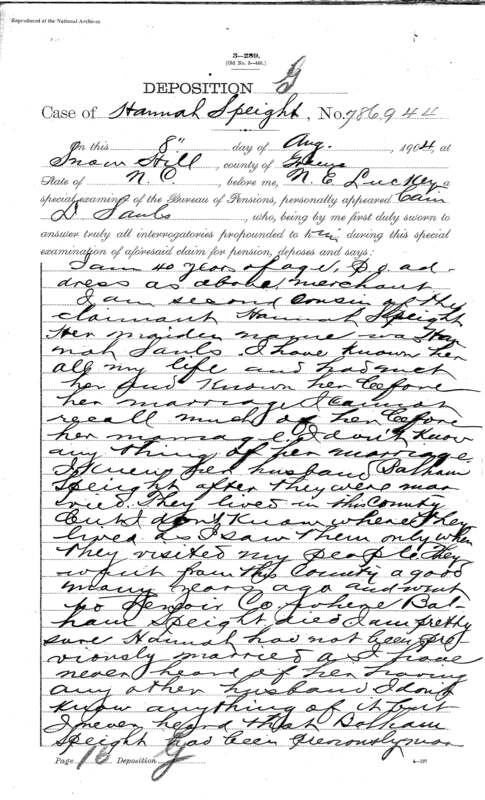 Lemon Speight’s Lenoir County death certificate lists his birthdate as 27 April 1867 — about a year-and-a-half before Baalam and Hannah married in late 1869. The certificate also names Baalam as Lemon’s father, but, as several witnesses testified, he was in fact the son of Loderick Artis. The file reveals other tantalizing tidbits, in italics, related to my family. How were Loderick Artis and Lewis Harper brothers? On their mother’s side? Or through Loderick’s father Daniel Artis? Cain Sauls, who was Loderick’s nephew, testified that he was Hannah’s second cousin. Her parents were Rosetta Best and Sheppard Sauls. Who was Sheppard to Cain? 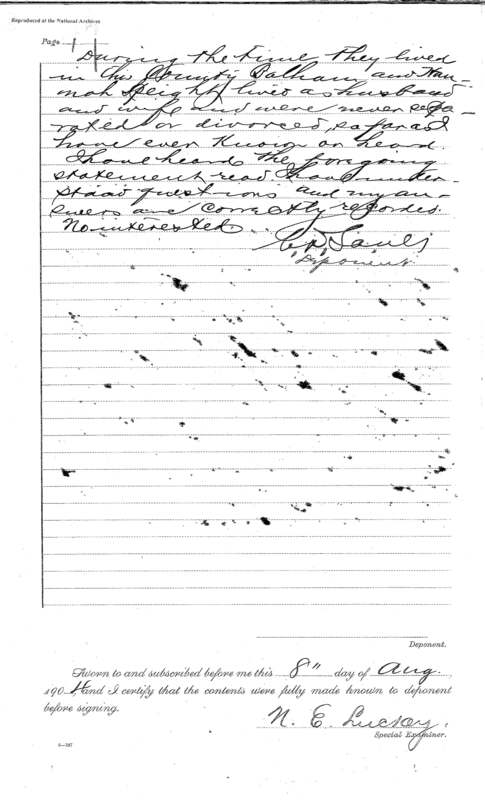 Deposition of Cain D. Sauls, 8 August 1904. File #786944, Application of Hannah Speight for Widow’s Pension, National Archives and Records Administration. Hat tip to Trisha Blount Hewitt for pointing out the mention of Loderick Artis in Baalam Speight’s file, #988961, which is included in Hannah’s file. M. had the same first name — an unusual one in that time and place — and last initial as my first cousin. We met when I, a year too young, tagged along to my cousin’s Brownie Scout meetings. M. and I discovered that we lived down the street from one another and from then until my family moved away three years later, we were inseparable. Several years ago, I did some basic genealogical research on M.’s mother’s family. 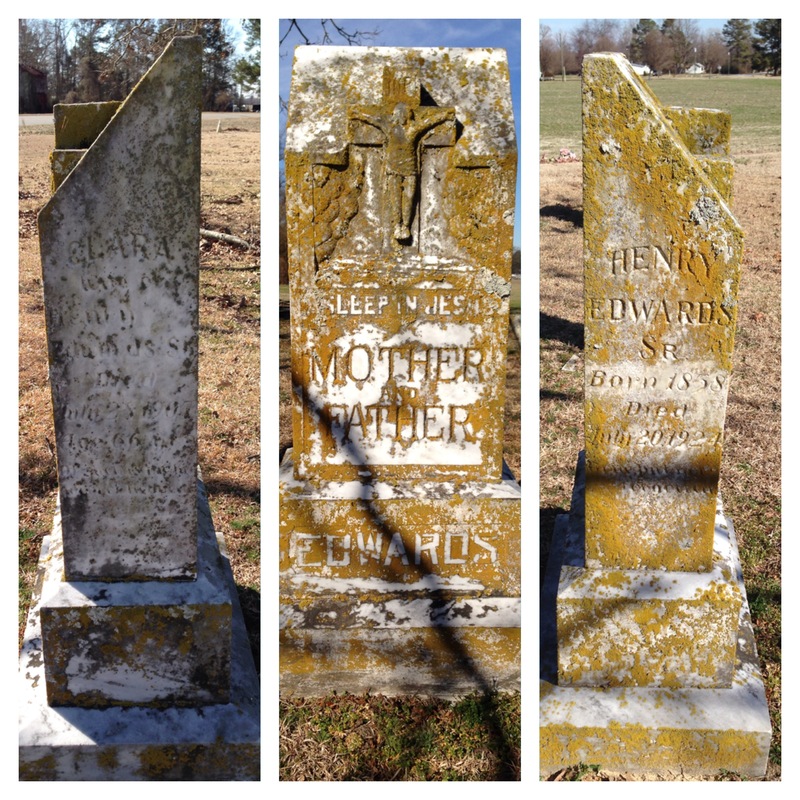 Her grandfather was a Greene County Edwards, and I was able to trace his ancestry back to slavery. I gratified by the achievement, but nothing in what I found resonated on a personal level. When I got back to my parents’ house, I hopped onto the internet. Twenty minutes, and a lot of scribbling and charting later, there it was. M.’s grandfather was the grandson of Mariah Sauls Edwards, who was the daughter of Prior Ann Artis Sauls Thompson, who was the daughter of Daniel Artis. In other words, M. is my cousin, too! P.S. I figured all this out the day before M.’s birthday. A little present for us both. P.P.S. An iron-clad childhood rule: “Don’t get in anybody’s car unless we have given you permission.” I broke it twice before the lesson took. The second and last time, I was about seven. I was playing down at M.’s house when her grandparents announced that they were about to ride down Greene County. I ran home to see if I could go with them. Nobody was home. I decided for myself and hopped in the car. I don’t remember much about the short visit — a white farmhouse on brick pillars standing on a slight hill, maybe? — but now I wonder. Was I visiting my own kin? Family cemeteries, no. 9: Daniel Artis’ Edwardses. A right turn out of my parents’ neighborhood puts me onto Highway 58. Head southeast, cross the edge of Stantonsburg, over Contentnea Creek and the Greene County line, and, 13 miles from home, you reach Lane Road. Turn left, round the curve, and there, neatly marked and kept, is the Edwards cemetery. Here are buried Daniel Artis‘ daughter Clara, her husband Henry Edwards, and their descendants. Photo taken today, Lisa Y. Henderson.